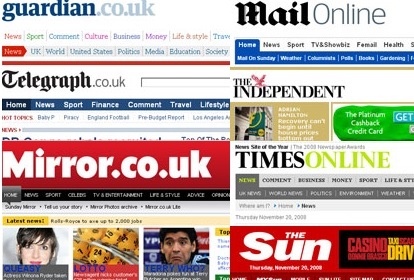 The Guardian, Daily Telegraph and Daily Mail figure in the top three positions in a study which analyses top UK newspaper websites for their popularity on social network, Twitter. The study, from Searchmetrics, also found that a Daily Mail story about a YouTube TV show that teaches dog-owners how to make homemade pet food was the most tweeted online newspaper article of 2014. The search experience optimisation platform analysed the number of tweets per week generated by content on 11 leading UK newspaper websites using the continuously updated database of search and social network data which powers its software for tracking digital marketing activity. The research (see list below) reveals that the Guardian website drives an average 392,358 tweets per week followed by The Daily Telegraph with 307,690 tweets per week and the Daily Mail (237,381 tweets per week). Perhaps fittingly for a nation of dog-lovers a Daily Mail article about a YouTube TV show which teaches dog-owners how to prepare homemade meals for their pets, took the top position in Searchmetrics’ analysis of the 11 UK newspaper websites’ most tweeted stories in 2014 (see below). The article was tweeted nearly 77,000 times. “Research indicates nearly three-fifths of Twitter's 15 million UK users follow at least one national newspaper brand or journalist²,” said Marcus Tober, CTO and founder of Searchmetrics. “Twitter is an ideal tool for driving additional traffic to news content and our research indicates that many leading newspaper sites are succeeding in this area.